1. How many times did you hear the names "Burris" and "Wheeler" during the play-by-play? Those guys are getting it done out there. It's a very promising sign in the talent evaluation department for the Raiders. One through the draft, the other through free agency, both making an impact and setting the tone. 2. My goodness, the Chiefs are awful. They won three out of five to end last year's season, beating the Bears, Packers and Broncos along the way, and losing to the Raiders only after taking the game into to overtime. One offseason later and they're just painful to watch. Obviously, this is great news for us, as is the slow-motion slide of the San Diego Chargers from elite outfit to perpetual mediocrity. 3. On that note, maybe this season can be the inverse of last season for the Raiders. A rough start followed by strong finish, and sneaking into the playoffs instead of just missing them. It's not impossible. The road to the playoffs, however, looks like it's going to go through Peyton Manning. Can't lose another one to the Broncos. 4. Stop dropping balls that Carson Palmer is delivering to your hands. This is the NFL. Well, a game against the lowly Chiefs with Brady Quinn getting the start...This is about as close to a "sure win" as the Raiders can expect, which means that we should brace ourselves for a game that's closer than we'd expect, given the team's penchant for playing down to the competition. I figure we'll get a nail biter or a blowout. Hopefully the latter. It's time. Well, this is a first in the long (by Internet standards) history of Raider Take: the Raiders actually proactively reached out to Raider Take. The message came from an affiliated "digital strategist" named Andy, who wanted me (and by extension, you) to know about a new free software download called Raiders DeskSite. Andy is with DeskSite, not the Raiders, but apparently he's been given to the green light to reach out on the team's behalf. So good for him (and them). I just downloaded the s oftware, and it seems pretty cool. Essentially, it's a video player that delivers and downloads team videos in the background, so that you can view them at your leisure. Videos include game highlights, team reports and more. So far, it has only downloaded a "how to" video about the app, but I presume more content is forthcoming. It definitely seems like a cool tool for keeping up with the Raiders. Apparently, there's an iPad and Mac version coming soon, to complement the PC version that I downloaded (the iPad would be perfect for something like this). I'm in wait-and-see mode until more videos are delivered, but so far, this looks like a nifty piece of fan outreach from the Oakland Raiders, just in time for us to watch highlights of a steamroll victory over the Chiefs this Sunday. 1. Some victories taste like a steak sandwich: nourishing and filling. Today's victory tasted like a plate of cotton candy. Vaguely pleasant, but ultimately unsettling. 2. This game was the pure inverse of the previous game. It was a game at home against a bad team that we easily could have lost, as opposed to an away game against a formidable team that we easily could have won. 3. I'm sort of stunned that we managed to turn a home game against another 1-4 team, minus its Pro Bowl running back and starting quarterback, into a grinding, hard-fought battle. One the one hand, I'm impressed that we won. On the other, I'm sort of horrified that it was such a battle in the first place. 4. "Half a Clown Car." That wasn't my idea, it was Angelic Raider who coined it in the aftermath, with others chiming in. It's hard for me to break out any sort of Clown Car after a victory. But I've gotta run with it, because it makes me laugh, and it's fairly apropos. 5. That first half was UGLY. It looked like something straight from Shell-Kiffin-Cable-Jackson. A lot of teams go through regime changes, and through the resulting fits and starts, but manage to at lease struggle in a different way than before. Take the Rams and Buccaneers. They were horrible last year. This year, they're not great, but at least they look different. With those teams, there's a vivid sense of change on the field. Whether or not it goes anywhere in the long run remains to be seen, but it's definitely different. Which you would expect from a regime change. Yet for much of this season, the Raiders have looked the same as always, like a carbon copy of Shell-Kiffin-Cable-Jackson. You can blame the players. You can blame the coaches. You can blame both. But I just think it really, really weird and inexplicable. Anyhow, in the preceding Guest Take, The5er asked for patience, and the Raiders bought some today. If they suddenly get their collective heads together and perform an inverse of last year (strong start, inept finish), there's still a chance to make some divisional noise. Crazier things have happened. Here's one thing we know for sure: after today, the Raiders will either be 1-5 or 2-4. Neither record is what any of us hoped for, and very few of us would have predicted. Here's another thing we know for sure, this is a time of transition for the team and organization, and patience may be required. Here’s another way to look at it… Unless you are a big shot Wall Street day trader or hedge fund manager, any good investment broker would tell you not to get overly attached to the peaks and valleys or changes in value of your stock over a short period of time. They would tell you to keep our focus and energy on the big picture. The real question we should be asking is how is your stock performing, or capable of performing over the course of a year, or even longer? So with that in mind, my plea to the nation this week is for exactly that… patience. To get re-aligned, lets all take in a couple of big deep breaths of the fresh Autumn Wind. With me know, 1,2,3 inhale… exhale. Again, inhale… exhale. Ok, I feel much better… you? The bottom line is that more than ever, I think we need to be looking at our teams and our franchises in a different way… as in, what does the overall trajectory look like? Rather than get overly distracted by a couple of plays here and there or single game performance, let's focus our energy on looking for clues which can tell us whether DA and Co. have the tools to put us in a position to win over the course of an entire season. Let's evaluate the core elements such as: Is our system capable, do we have the key personnel, do we show poise in critical situations, what is the culture like? For me, this all reverberates one central theme… patience. All you need to do in today’s NFL is keep from steering the ship into the shore in the first 8-10 games in order to give yourself a chance in late November and December. From there, its all about getting into rhythm and finding a way into the post season dance. Hell, even the value of home field advantage has diminished over the years. Again, 3 out of 5 Wild Card teams collecting Super Bowl rings after running the table on the road further demonstrates this point. Now that we have the cleaned the lenses on our hypothetical spectacles, lets come back and re-evaluate the outlook for the remainder of the season. First, I have a hard time believing that SD or the Donkeys are poised to run away from the pack in the West. Both still have challenging games ahead and I would expect them to be no better than the 4-4 or 5-5 category come mid November. With that being said, as bad as it’s been, I think the Raiders are still very much in this thing. We have 3 very winnable games in front of us so as far as overall trajectory goes, if we can anyway continue to resemble the team that showed up in Atlanta last week I believe 4-4 and even 5-5 is a distinct possibility. That being the case, it will be anyone’s division heading into December. Which, as I’ve tried to outline above, is really all that matters. I get a ton of pitches from public relations reps asking me to help promote this or that, but I rarely do anything with them. But occasionally something jumps out at me from the inbox, such as the email I received yesterday from Doc Goodie at Tarnation Sports, a nostalgia sports apparel company. As a kid, I was a Raiders fan...And a Star Wars fan. So when Doc sent a link to his VADERS shirt, I thought it was cool and clever. Apparently, the folks at Lucasfilm don't like Doc allegedly pilfering their intellectual property, so they've asked him to cease and desist. I asked Doc about "protected parody," or fair use, which can legally protect the use of copyrighted imagery when used for parody. Doc replied, "Well the problem is we are a two-man outfit working from home, so it's David's little brother vs. Goliath! It's always a gray area dealing with parody but can we afford to fight the evil empire? Like I said, do a google search and find hundreds of similar designs, but we're the one they picked to make an example of." I suspect that it's probably not a fight worth fighting anyways, considering this tidbit from a legal site about protected parody: "Your parody will not gain fair use protection if it simply borrows the general style of its target or places the characters from a familiar work in novel or eccentric poses." 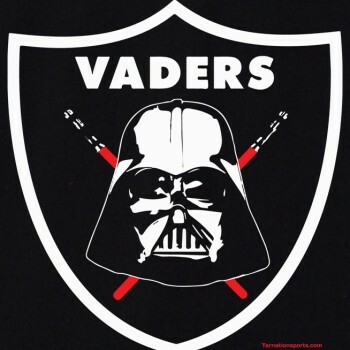 Anyhow, the upshot is that Doc needs to unload all of his VADERS shirts over the next few days. Just Google "Tarnation Sports" and you'll find it on the home page. Gentleman, please accept this humble petition to prevent the prevent defense, which only seems to prevent the Raiders from winning. It happened again on Sunday. Since you've only been with the Raiders for less than a year, you might simply view this as a mere incident. But let me assure, it's not an incident, it's a plague upon the Raiders franchise. The Raider Nation has seen it countless times over the past 15 years, spanning countless coaching regimes. It's like a nightmare on infinite loop. The Raiders get a late lead or tie, then go soft and lose the game after giving up ungodly chunks of yardage in the span of mere seconds. Next thing you know, you've given up 50 yards in 40 seconds. Do you realize that, with an average time of possession of 30 minutes per game, an offense would gain more than 1,500 yards per game at that rate of yardage consumption? Why, at any time, would you employ a scheme that allows that rate of yardage consumption? Why would you start throwing curveballs in the ninth inning when they've been missing your fastball? WHY!? The other team is trying to score throughout the game, not just in the final minutes. So why change the approach that got you the lead or the tie in the first place? Why go suddenly soft? If you are going to lose by employing the prevent (and you are), then you have nothing to lose by not employing it. Also, don't count on the other team missing that last-second long field goal after you've "contained" them by giving up 50 yards in 40 seconds. Why? Because the other team never misses those kicks against the Raiders. Never. Remember 12 years ago, when Adam Vinatieri smoked a 45-yard field goal through wind and sleet to take the game into overtime, then kicked another field goal to win, eliminating the Raiders from the playoffs? Or last Sunday, when Matt Bryant nailed that 55-yarder? It always happens, no matter the distance and conditions. You are powerless to stop this late field goal phenomenon. It is unique to the Raiders, and it is very real. So your power lies in preventing the prevent, and in trying a different way to stop the other team to keep it out of field goal or scoring position. It may be tough to resist the prevent. I suspect that there's some weird universal force that is controlling the minds of all Raiders coaches in this situation. It's the only explanation for so many coaches, and so many coordinators, over so many years, doing the same thing every time in these situations, and expecting a different result from the last time. The Return to Glory will not be paved by the prevent. To paraphrase the great Al Davis: "We don't take what they give. We take what we want." 1. What is up with this seemingly terminal affliction of playing down to lesser opponents, then surprising everyone with tough losses (and occasional wins) against formidable teams? 2. Atlanta cut through our "prevent" like a hot knife through butter. You saw it coming. You always see it coming. How many games have the Raiders lost like that over the past 15 years? We must own some sort of record in giving up 10-to-20-yard plays in the final minute. It's like the coaching staff, from one staff to the next to the next, is powerless against the PREVENT DEFENSE MIND-FORCE THAT CONTROLS THE RAIDERS FRANCHISE WHEN PROTECTING A LAST-MINUTE LEAD. Or last-minute tie. Dennis Allen, like the previous seven Raiders coaches before him, is powerless to stop "PDMFTCTRFWPALML." 3. That late Palmer pick was brutal, but you gotta love our own trio of picks. But wassup with McFadden? 4. This division is for the taking. The Chiefs are non-existent. The Chargers and Broncos aren't special. There's no reason we shouldn't be competing in this division. Yet here we are at 1-4 in the wake of another "moral victory," which is also known as a "loss." 5. Yet there's still hope. In the words of Corkran: "The Raiders are about to embark upon a three-game stretch in which they have a realistic shot at evening their record. They host the Jacksonville Jaguars (1-4), play the Kansas City Chiefs (1-5) on the road, then host the Tampa Bay Buccaneers (2-3) in the next 15 days. If the Raiders reach 4-4, the playoffs remain a distinct possibility. Losing any of the next three games puts a damper on the Raiders playoff aspirations."